• Capezzana Novello comes to us from the ancient estate of Tenuta di Capezzana, which sits on the outskirts of Tuscany. Their olive oil is made using primarily Moraiolo olives, and a smaller amount of the piquant Frantoio olive. The olive oil is extracted using the newer technology of a stainless steel continual press. The oil is then filtered through a fine cotton sieve, and bottled. Poured from the bottle, the oil is neon chartreuse in color, with a citrusy aroma. We tasted green tea, sweet fruitiness – specifically the tannins of pear skin, and a lingering gentle pepper. 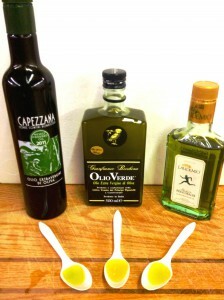 Though it’s a Tuscan oil, we think the Capezzana Novella is delicate enough to use on all matters of fish and seafood. Or perhaps just used simply to dress bitter greens, or drizzled on a crusty hunk of bread. • Olio Verde Novello comes to us from Gianfranco Becchina who cultivates his olives and oversees the olive oil production on his sixty-acre estate near the Western Sicilian town of Castelveltrano. It is on the opposite end of the spectrum in terms of both its production style, and flavor, to the Cappezzana. Gianfranco’s oil is made using the pungent Nocellara del Belice (DOP) olive, a longstanding favorite of Sicilian olive oil producers. He uses a stainless steel continual press to extract the oil from the olives, and a centrifuge to remove any remaining water and pomace. Beyond that, the oil is left unfiltered, which accounts for the cloudiness of the oil. Olio verde is a big grassy oil, it smells like a freshly mowed lawn, we think it tastes a bit like green tomatoes, with an artichoke-y bitterness and a big pepper finish. If you feel the need to experiment with this oil, all test-batches can be sent to the Great Ciao warehouse to be judged by our tasting professionals, especially if you are drizzling it over roast meats, or mashed potatoes. 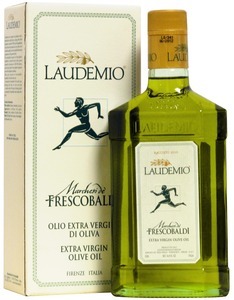 • Laudemio Frescobaldi Novello oil was delivered to our warehouse yesterday. The Frescobaldi family has been a central player in Tuscany’s cultural, economic, and gastronomic scene dating back to the renaissance. Today they work to preserve the gastronomic heritage of the region by overseeing the Laudemio consortium of thirty-two olive growers in the Tuscan countryside. Other members of the consortium can bottle their oil using the “Laudemio” packaging and insignia. However, the oil we import from Laudemio bears the Frescobaldi name, and is produced with the olives grown on the Frescobaldi estate. The oil is blended according to their exacting specifications of Tuscan olive varietals: Frantoio (70%), Moraiolo (20%), and Leccino (10%). The oil is what you would expect of a Tuscan novello, with big grassy undertones, a silky rich mouthfeel, a bitter grapefruit tang, and a strong pepper finish. Of our three novellos, this is the boldest. The oil pours out brilliantly lime-green from the bottle. This olive would be visually striking (and delicious) drizzled on top of soups, perhaps in a citrus salad, and can hold its own when used to finish a steak.